Webster University President Elizabeth (Beth) J. Stroble and Provost, Senior Vice President and Chief Operating Officer Julian Schuster are pleased to announce that Douglas P. Anderson has been named Interim Chief Financial Officer (CFO), effective Jan. 21, 2016. Anderson brings over 30 years of financial and senior leadership experience in both the non-profit and for-profit arenas. He served over 20 of those years in the capacity of CFO. Anderson will lead the Office of Finance and Administration and be responsible for oversight of financial policy and provide direction for long-term budgetary planning, cost management and investment opportunities in alignment with Webster University’s strategic plan, Global Impact for the Next Century. This position is part of the University’s senior leadership team, Provost’s Council and serves as Treasurer to the Webster University Board of Trustees. "Doug brings extensive senior leadership experience to Webster at an important time in our university’s history," Stroble said. "His ability to lead teams to new levels of success will be important as we continue to identify priorities and allocate resources effectively to fulfill the Global Impact Strategic Plan." "We are delighted that Doug is joining us as Webster enters its second century," Schuster said. "His experience in analyzing critical business issues and negotiating transactions, as well as his exemplary traits of leadership come at a critical time for Webster as we advance academic excellence and operational efficiency. I look forward to working with Doug and welcome him to the Webster University community." 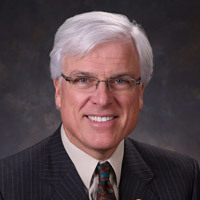 Most recently, Anderson served as the senior vice president for finance at Hamline University, where he spent 12 years leading the areas of finance, investments, facilities, human resources, risk management and technology. He served for over 10 years as vice president and CFO of Lutheran Social Service of Minnesota in St. Paul. Other appointments include president of Mains’l Services, Inc., where he doubled the revenue from $10 million to $20 million in a four-year span, and senior accountant with Deloitte, Minneapolis. A certified public accountant, Anderson holds a bachelor’s degree in accounting and an MBA from the University of Minnesota.